LAWRENCE — Police shootings of African-Americans in recent years have touched off the Black Lives Matter movement and protests in American cities such as Ferguson, Baltimore, Baton Rouge and Charlotte. But all cases were responses to instances of more systematic inequality surrounding race and class — such as mass incarceration and the war on drugs — issues that were decades in the making, said Tony Bolden, a University of Kansas associate professor of African and African-American studies. "What’s happened in places like Ferguson and so many others is that many youth are interpreting repeated police-involved shootings in political terms. From this standpoint, injustices that people experience as individuals become calculated transgressions against the collectivity of their social group," Bolden said. "Then something miraculous happens. Imbued with a new, communal outlook, people begin to lose their fear and reluctance to challenge authorities openly on political grounds." Bolden, who studies social movements, has written an essay, "The Racial Contract: Ferguson as Metonymy — Why Now?," that was published recently in CLA Journal. In addition to shootings that preceded protests, the recent economic collapse and inequality hit poorer communities hard, and the 2008 election of President Barack Obama, whose elections symbolized success of the civil rights movement, were factors that contributed the recent racial divisions and strife. Black Lives Matter is a social movement, but its multi-ethnicity seems to be the reason why it appears to be more successful and cohesive than previous protest of police brutality and other issues in recent decades, Bolden said. "In particular, the movement's inclusivity has inspired many people from various cultural backgrounds and sexual orientations," he said. Bolden said after the shootings last summer, especially the killing of police officers in Dallas, he hoped that cooler heads would prevail in the long-term and that it wouldn't detract from what Black Lives Matter activists are seeking to achieve regarding many larger and complex issues in American society. "What the movement proposes — equal treatment of black- and brown-skinned people within the criminal justice system, i.e., the abolition of the racial contract as the basis of policy in American courts, prisons and jails, is mutually exclusive of white supremacy," he said. "Because police brutality is related to labor, education, prisons and other sectors of American life, the activists' demand is a de facto petition for a decidedly different society." 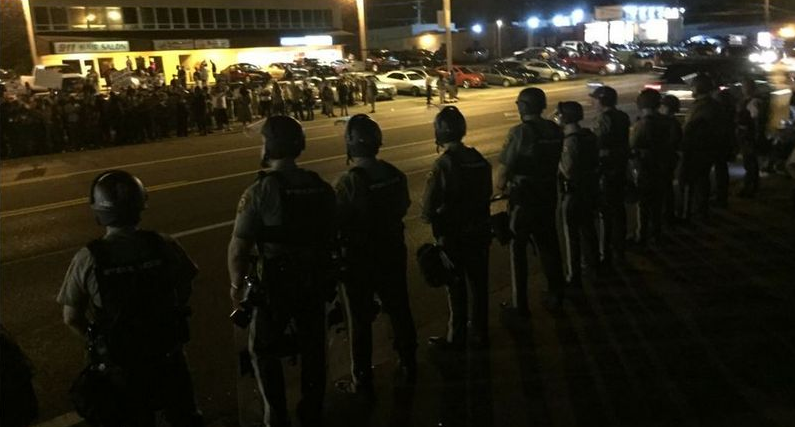 Photo: Police and protesters shown Aug. 10, 2015, in Ferguson, Missouri. Credit: VOA/K. Farabaugh, Wikicommons.